The Liberty Division All-Stars look to put an end to the Freedom Division All-Stars’ reign over the Atlantic League’s Mid-Summer Classic. Freedom’s side has won the previous six matchups between the divisions dating back to 2011. This will be Long Island’s third time hosting the All-Star game, with the most recent occurring in 2010, and the first occurring in 2002. The Somerset Patriots and Sugar Land Skeeters clinched playoff spots after winning their respective divisions following 63 games. The Patriots rode a hot start to a first-half title, fending off a late push from the New Britain Bees, who pulled within two games by the end of the half. Somerset’s first-half record was 35-28, while the Sugar Land Skeeters held the best record in the league as a whole at 41-22. The Skeeters were trailing the Lancaster Barnstormers late in the half, but took six games from them in a seven-game series near the end of the midseason. Bennett Parry has been arguably the best pitcher in the Atlantic League this year, and starts for the Liberty Division tonight. The 6-foot-6 lefty owns a 6-1 record with a 2.60 ERA over 12 starts thus far. His 104 strikeouts lead the Atlantic League this season, and his ERA places him third in the circuit. The California native was brilliant once again in his last start, throwing seven shutout innings against the Skeeters just three days ago, striking out 10. The Freedom Division will have Robert Carson start tonight, who began the season in the bullpen before transitioning to a starting role. The Mississippi native earned a quality start but took the loss in his last outing, going six innings and allowing three runs in a 3-2 loss to the Sugar Land Skeeters last Wednesday. The lefty is a three-year Atlantic League veteran, spending time with the Bridgeport Bluefish and Southern Maryland Blue Crabs in the past. Carson also has 31 major league appearances under his belt with the Mets dating back to 2012 and 2013. TOP 1: Ducks starter Bennett Parry starts the All-Star Game with a one-two-three inning for the Liberty Division! BOT 1: Julio Borbon of the Somerset Patriots starts the scoring with an absolute bomb to right field! 1-0 Liberty! TOP 2: Cory Riordan of the Somerset Patriots follows Bennett Parry’s lead and retires the side in the second inning. BOT 2: Catcher Ryan Casteel of the Lancaster Barnstormers turns a great double play to highlight York’s Mitch Atkins’ inning of work! BOT 3: Konner Wade of the Sugar Land Skeeters draws a double play to get out of a two-on one-out jam, keeping the Freedom Division ahead 3-1! TOP 4: Pitcher Rainy Lara of the New Britain Bees knocks down a grounder towards Jordany Valdespin to end the inning! Still 3-1 Freedom. BOT 4: Third double play turned by the Freedom Division in four innings as Nate Reed of the @gobarnstormers keeps the lead for Freedom at 3-1. TOP 5: Duane Below of the Somerset Patriots deals a perfect inning for the Liberty Division! BOT 5: A couple of Somerset Patriots come through after Mike Fransoso doubles home a run, and Alfredo Rodriguez gets a run-scoring base hit off Southern Maryland Blue Crabs pitcher Sam Runion! All tied at three! BOT 6: York’s Grant Sides grants a two-out walk but gets the next batter to ground out to keep the score at 3-3! TOP 7: Perfect inning for Ducks sidearmer Wander Perez! Still 3-3 into the seventh inning stretch! BOT 7: Nice and easy one-two-three inning for Lancaster Barnstormers submariner Garrett Granitz! Pitching is taking over here at Bethpage Ballpark! TOP 8: Road Warriors closer Andrew Johnston keeps the game tied, forcing a ground-out with a man on to end the inning! BOT 8: Scott Shuman of the Lancaster Barnstormers gets into trouble with a runner in scoring position, but gets a clutch strikeout to end the inning! TOP 9: New Britain Bees closer Evan Scribner looks brilliant while striking out the side for the Liberty Division! Tied at three heading into the bottom of the ninth! FINAL: Alfredo Rodriguez of the Somerset Patriots walks it off with a single down the line! 4-3 Liberty! What a game! It’s officially April folks! That means there is less than a month left before the Ducks take the field to embark on their 19th season of play in the Atlantic League. The roster has been taking shape since the calendar flipped to 2018, and there are a lot of key pieces to the puzzle already complete. However, there is surely more work to be done before the first pitch is thrown on April 27th down in Southern Maryland. One of those important figures added to the roster is none other than former Major Leaguer Jair Jurrjens. The pitcher first entered the big league radar in 2007 when he was called up by the Detroit Tigers. After making seven starts with the club, he switched leagues in the offseason when he was traded along with Gorkys Hernandez to the Atlanta Braves for 1997 World Series hero Edgar Renteria. After a solid first full season at the game’s highest level in 2008, a year in which he finished third in National League Rookie of the Year voting, he fully stepped into the spotlight with a memorable 2009 campaign. Jurrjens led the NL in games started (34) and posted the league’s third-best earned run average (2.60). His 215 innings pitched ranked ninth in the league as well. The Curaçao native struggled in 2010 but bounced back with an All-Star season in 2011. Jurrjens went 13-6 that year with a sparkling 2.96 ERA and a pair of complete games. Though he would spend time in MLB over the following three years, injuries and struggles prevented him from maintaining that All-Star status. The 32-year-old would go on to pitch in the Baltimore Orioles, Cincinnati Reds and Colorado Rockies organizations before spending the 2017 season with the Los Angeles Dodgers organization at Triple-A. Now, after posting strong numbers in the Dominican Winter League with Tigres del Licey this offseason, Jurrjens finds himself with another new home: Central Islip, N.Y. The Ducks signed the eight-year Major League veteran at the beginning of March, and he is now gearing up for his first season in the Atlantic League. Like many before him, this season presents an opportunity for the righty to prove that he deserves a spot with a Major League organization and that he could once again pitch in the big leagues. Jurrjens seems determined and ready for the challenge ahead. How do you view this new chapter of your baseball career with the Ducks and the Atlantic League? As an eight-year Major League veteran, are you looking to use this opportunity to mentor some younger teammates while also learning from them? Will you lean on the guidance of Atlantic League veterans regarding how to pitch to certain players? Being that you pitched in the same organization as former Duck Rich Hill in 2017, did his experience with the Ducks have any influence on your decision to come play on Long Island? What does it mean to you to be the first pitcher from Curaçao to reach the Major Leagues? How special was it facing fellow-countryman Andruw Jones for the first time in 2008? You flourished in your second full season in the Majors (2009). What enabled you to be so successful? Is there one memory that stands out most from playing in the 2011 MLB All-Star Game? Does it give you added motivation this year to play in the Atlantic League All-Star Game because it’s being held in your home ballpark? How much of an honor was it to represent the Netherlands twice in the World Baseball Classic (2006, 2017)? Injuries derailed your 2011 season toward the end. Do you think that contributed to your subsequent struggles in the Majors? Do you have any personal or team expectations going into the 2018 season? What are you looking forward to most about coming to Long Island? Alex Burg had two goals upon joining the Ducks for the first time in 2017: to win an Atlantic League championship and to earn a contract from a Major League organization. While he came up just short of accomplishing the former, he can now celebrate achieving the latter. The catcher, who had signed on for a second season with Long Island back on February 1, was inked to a minor league contract by the Los Angeles Dodgers this weekend. He will head to Glendale, Ariz. to join the team at its spring training facility, looking to prove his worth to the organization. Getting to this point required a decision that Burg made back during the spring of 2017. Prior to beginning his first experience in the Atlantic League, he knew exactly what he hoped to gain from the opportunity. The Washington native was looking for some consistency after spending seven seasons as a utility player in three different Major League organizations. During his time in the San Francisco Giants, Miami Marlins and Texas Rangers’ systems, the first place to look for Burg was not behind the plate. He spent most of his innings in right field (803.2) but was also frequently found at third base (649.0). He spent some time at first base, second base and in left field as well. Versatility is a tremendous asset for any ballplayer and a trait that field managers adore. However, Burg’s belief was that his best position was at catcher and that the key to returning to an MLB organization would be to spend a full season there. 2017 represented a little bit of everything for the 30-year-old. While taking to a specific position for the duration of the season, the experience required a great deal of work to prove his worth behind the plate. As the season progressed, Burg received a great deal of help from his teammates and coaches and put in extensive work to refine his craft. The results on the field, in his opinion, were certainly a positive development. A major reason why the Washington State University alum was able to develop defensively was the work he did with teammate Jordan Pacheco. The former big leaguer, who, like Burg, was signed by an MLB organization this offseason (Twins), was also fine-tuning his craft behind the plate. After suffering a shoulder injury the previous year, Pacheco needed to build back up the strength in his arm while also reacclimating to the role. This dynamic offered the forum for an exchange of tutelage between the two backstops. Though he was happy with the improvements made in his defensive game, his offensive performance was a bit of a bumpy road. Burg got out to a strong start to his season, driving in seven runs over the season’s first eight games and bringing a .278 batting average into the month of June. After securing a spot in the Atlantic League All-Star Game, the wear and tear from catching so frequently began to take its toll. Burg struggled in the second half despite the Ducks earning a postseason berth, and he ended the year with a .225 batting average, well below the .260 average over his previous seven seasons. Fortunately for the former Giants draft pick, a playoff spot gave him the opportunity to wipe the slate clean and show that he could still be dangerous offensively. In Long Island’s seven postseason games, no other Duck had a batting average within 50 points of him. Burg hit .348 (8-for-23), with the next closest teammate being Marc Krauss at .296. In addition, Burg clubbed two of the team’s three postseason homers, scored five runs and drew four walks. Because of his tremendous turnaround, the Ducks were able to claim their second consecutive Liberty Division Championship over the rival Somerset Patriots. Looking back now on what allowed Burg to flip the proverbial switch, he was able to attribute the success to a conversation with a close friend and fellow ballplayer whom he works out with in the offseason. While his goal of bringing home a championship came up short against the York Revolution, his first experience in the Atlantic League was an overwhelming success. He was able to enjoy a high level of play, focus on winning and develop a consistent presence at one position. All of that has now culminated in a second chance at achieving his Major League dream, a chance that might not have happened otherwise. Now that he has a full year of catching under his belt, Burg knows what to expect from the position. The mental and physical grind is tougher than just about any other position on the field. It has a significant effect over the course of time. Knowing this, and his desire to avoid a downturn as the season progresses, Burg has focused his offseason workouts on keeping his endurance high. It remains unclear where Burg will begin his 2018 season. He split time at Double-A and Triple-A in 2016 prior to joining the Flock, leaving either of those as his likely destination. However, the sky is the limit for him with the Dodgers. With a new workout regimen to keep up his strength, a full year of catching experience in his arsenal and a second chance at living out his dream, Burg could one day be wearing Dodger blue in a big league ballpark. The 2018 season will feature a 126-game schedule with two 63-game halves. With the addition of the Road Warriors, a league-operated travel team, the Ducks will play 72 home games and 54 road games to make up the 126-game slate (normally 70 home, 70 road, 140 total). The Ducks’ regular season begins on the road against the Southern Maryland Blue Crabs (for the second year in a row) on Friday, April 27. The 2018 Home Opener for Long Island will be on Friday, May 4 against the Blue Crabs at 6:35 pm. 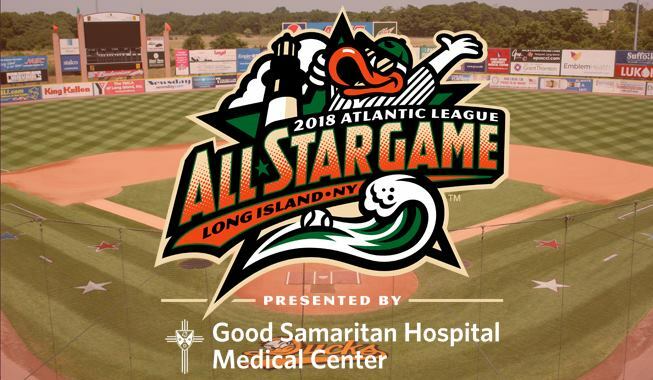 Bethpage Ballpark will host the Atlantic League All-Star Game on Wednesday, July 11 at 6:35 pm. First Liberty Division Championship Series rematch vs. Somerset Patriots: May 1-3 in New Jersey (Home: May 25-27). First Atlantic League Championship Series rematch vs. York Revolution: June 7-10 in Pennsylvania (Home: June 25-28). In other league news, the seven clubs returning from the 2017 season all took part in a Dispersal Draft on Wednesday morning. This draft was held to allow teams the opportunity to obtain the 2018 negotiating rights of players whose rights had been controlled by the Bridgeport Bluefish. This included players who were on Bridgeport’s active roster, inactive list, disabled list or had their contracts purchased from the Bluefish during the course of this past season. Those not included were players who had been released or traded by Bridgeport. Rather than having all Bluefish players become free agents and all seven teams battling for their services, teams drafted in order (based on 2017 overall regular season win-loss record) to obtain the rights to desired players they hope to sign for 2018. Fields brings a little bit of everything to the table should the Ducks eventually sign him. The outfielder played in 85 games for Bridgeport in 2017 and showcased an ability to get on base as well as some power. He compiled a .297 batting average and 88 hits to go along with a .387 on-base percentage and an .873 OPS. The 26-year-old finished the season with 12 home runs, 51 RBI, 54 runs scored, 18 doubles and 37 walks. Although Fields did not possess tremendous speed (one triple, one stolen base) and was a bit strikeout-prone (90 K’s) in 2017, he has 36 triples and 93 stolen bases in 787 career games. Defensively, Fields made just three errors in 63 games played in the outfield last year and posted a .990 fielding percentage in his seven seasons of affiliated baseball before joining the Atlantic League. The Detroit native reached the Major Leagues with his hometown Tigers in 2015, picking up a double and a run scored in his lone big league game. He spent six seasons in the Tigers organization before splitting 2016 in the White Sox and Dodgers’ systems, reaching Triple-A with both. Like Fields, Pestano is also a former Major Leaguer. The right-handed reliever has six seasons of MLB time with the Cleveland Indians (2010-14) and Los Angeles Angels (2014-15). In 223 career appearances, he accrued an impressive 2.98 ERA, 11 saves and 244 strikeouts in 202 and two-thirds innings, good for a 10.8 K/9 ratio. The 32-year-old impressed out of Bridgeport’s bullpen in 2017, pitching in 26 games and going 1-1 with a 3.25 ERA, one save and 30 strikeouts to just five walks in 27 and two-thirds innings. With the Bluefish bidding for a playoff berth, he tossed 10 consecutive scoreless appearances from August 16 to September 7 spanning a total of 11 and one-third innings. The California native also threw two scoreless innings at Bethpage Ballpark, striking out three. Prior to joining Bridgeport, Pestano made eight appearances with the Yankees’ Triple-A affiliate in Scranton/Wilkes-Barre, Pa. in 2016, yielding four runs in 10 and two-thirds innings while striking out 16 and walking one. Not to mention, he was once referenced in an episode of “How I Met Your Mother” by Ted Mosby (Season 8, Episode 4)! Dominant left-handed relief pitchers are not easy to come by, but the Ducks got the rights to one in the third round on Wednesday. Perez compiled a miniscule 1.71 ERA in 22 games for the Bluefish this past year, surrendering just four earned runs in 21 innings of work. He also struck out 25 batters while yielding only five walks and picked up a save along the way. After joining the team at the end of July, the 32-year-old made 15 consecutive appearances without allowing an earned run to encompass the month of August. He also pitched three and one-third scoreless innings on Long Island, striking out six. The Dominican Republic native also was a member of the Bluefish in 2015, tossing five and two-thirds scoreless innings over six games. Perez has previous experience in the Chicago White Sox organization and began 2017 with Lehigh Valley (AAA, Phillies). The Ducks inked the rights to a third consecutive relief pitcher in the fourth round with Ramirez. The right-hander had tremendous success for Bridgeport last year just like Pestano and Perez, going 5-2 with a 2.16 ERA and two saves in 31 games for the Bluefish. He struck out 30 batters in 33 and one-third innings while walking just six, including none in his final nine outings of the season. The 30-year-old joined Bridgeport at the end of June and began his tenure by not allowing an earned run in 11 straight outings, spanning 11 and two-thirds innings. He then went 13 consecutive outings with no earned runs from August 4 to September 12. The Dominican Republic native also pitched four and two-thirds scoreless innings on Long Island in 2017. Ramirez reached the big leagues with the Mets in 2012, striking out 22 batters in 21 and one-third innings. Control can sometimes be an issue, as he walked 20 batters with the Mets and 260 in affiliated ball experience over 463 and one-third innings, but he averages over seven strikeouts per nine innings. In addition to spending six seasons in the Mets organization, Ramirez has also pitched in the Angels and Reds’ systems. Parra marked the fourth pitcher and second lefty whose rights the Ducks acquired. The southpaw joined the Bluefish late in the 2017 season and made nine starts with mixed results. He was 3-4 overall with a 5.87 ERA and 43 strikeouts in 46 innings. He allowed 19 walks but surrendered 60 hits. The 35-year-old began his Bluefish career with a strong performance against the Ducks, pitching five and two-thirds innings of two-run ball while striking out seven at Bethpage Ballpark. He then bounced back after a couple of tough outings to allow three earned runs or less in five of his final six starts. The California native carries eight seasons of MLB experience, including five with the Brewers (2007-10, ’12) and three with the Reds (2013-15). He was 29-41 with a 4.90 ERA and 592 strikeouts in 322 games (74 starts) at the game’s highest level. Parra began 2017 with Triple-A Iowa in the Cubs organization and has split time throughout his career as a starter and a reliever. Ducks fans are surely familiar with Burroughs. The former big league infielder spent parts of the 2015 and 2016 seasons in a Ducks uniform and also donned a Bluefish jersey for parts of four years (2014-17). He has showcased a tremendous hitting ability since entering the Atlantic League, compiling a .334 batting average, 144 RBI, 145 runs, 67 doubles, 115 walks and a .394 on-base percentage in 336 games. In his two seasons with Long Island, the California native combined for a .321 batting average and 33 RBI in 79 games. He also brought a very likable personality to the clubhouse, always sporting a big smile and sharing laughs around the batting cage and dugout. Last year with Bridgeport, the seven-year MLB veteran ranked second in the Atlantic League with a .328 batting average. However, fans wondering why he was not drafted earlier on Wednesday must remember that he played in just 92 games last year after twice leaving the team (6/27-7/19 and 9/5-end of season) for the birth and care of his son, Knox. Though he has not announced his official retirement, it certainly remains possible. Stay tuned for more news and notes as the offseason progresses. Over the next couple of months leading into the holidays, we will be highlighting which Ducks alumni are playing winter baseball in the Caribbean or overseas. In addition, we will also have feature articles on members of the 2017 Ducks and eventually will count down some of the top moments from this past season.